Often confused and intermixed! Dubbing and voice-over services are definitely not the same nor are they used for the same purpose. Voice-over refers to a production technique in which a disembodied voice broadcasts in film, television or radio. The script/text is translated and recorded by a voice-over artist or a narrator who does not himself appear on-screen. Voice-over is also referred to as “UN Style” and is basically narrative in nature – more of storytelling in the background. Dubbing is much more active. Dubbing, also known as Language Replacement, substitutes a target language with each person appearing on screen. Dubbing services are recorded by professional voice actors who mimic the expression, tone and lip sync of the actor on screen but in a different language. Before voice over companies can perform dubbing, the script and dialogues need to be translated into the desired language. This can be tricky because the choice of words must convey the message in the same time frame for unnoticeability and richness in the overall audiovisual experience. 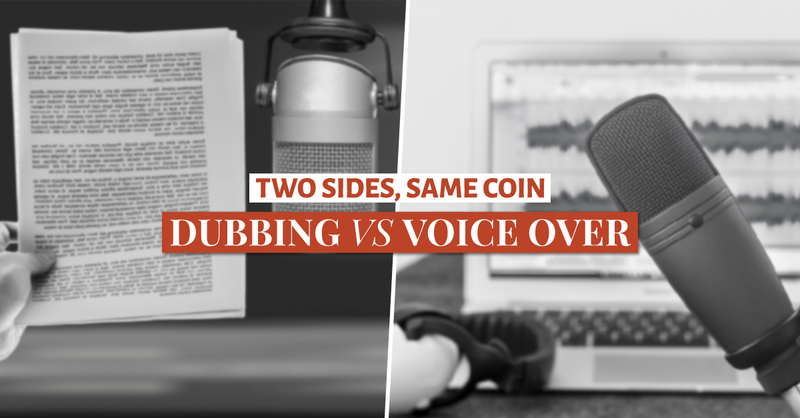 Clearly, the difference between the two services leads us to the next question: when to use dubbing or voice-over? Voice-over is commonly used in documentary clips (like Discovery Channel does), digital learning or news-related audiovisual segments – all of which are short and have the translation as the main objective. This kind of visual content requires voice-over because there is little emphasis on the nuances of tone and emotions. Voice over works great for smaller contents like footage from on-the-field, or conferences where voice-over is done by a live interpreter. Thus the term: “UN Style”. Dubbing, on the other hand, is used when the objective is information retention. Dubbing combines tonality, dialect, words, emotions, nuances, and accents to convey a richer absorbing message. It is used by the entertainment industry for movies, films and performance videos to capture the original content’s intent. Dubbing is required when the video is conveying high-impact information in big amounts and the content is needed to sound and look very native to the audience. Blue Microphones are one of the top choices of voice-over companies. They are user-friendly and look appealing. Some of the portable USB-connecting options are Blue Snowball and Blue Yeti. Other options to look for are MXL USB 006 Cardioid Condenser Microphone or Audio-Technica Cardioid Condenser USB Microphone. You should never carry a mic in your hand. A good quality microphone stand is essential to hold up the mic in a steady grip to ensure that all your recordings are even, consistent and rattle/noise free. A shock mount is needed to suspend a microphone with elastic or rubber bands. This gets rid of the vibration that the mic can pick up otherwise. Even good quality sensitive condenser mics can pick ‘plosive’ sounds when one speaks and create ‘pop’ sounds in the recording. A pop filter can diffuse those sounds easily and is an essential tool for recording a good voice over. To avoid hearing an echo produced in an empty room in your voice over recording can be undesirable. It needs to be controlled and one way to do that is to create a home studio. A home studio can keep out external noise and also control the sound reflections within a space. There are a number of smart applications to choose from. Audacity is a free program which works for PCs, Macs, and tablets. It has all the needed editing tools for a polished voice-over submission. Better budgets can buy higher quality software like the advanced Pro Tools S6 or Adobe Audition CC or Sound Forge. Other useful apps which can be used in iPads and tablets with editing capabilities include TwistedWave, audition and WavePad Audio Editor. Voice-over professionals make sure they stay at the top of their voice-over game by being organized and productive. One way to ensure that is to use productivity tools. These can be stored on the Cloud and can be accessed from anywhere at any time. Common productivity tools are notetaking, task management, keeping track of calendars and schedules, project management, time management and storing data in spreadsheets. Dubbing is a long process that starts with translating content in target languages, adapting content to the on-screen time frame, selecting the right voice-actors, recording and post-production editing. In the whole process, some engineering tools are required to complete a high-quality dubbing. You may use VoiceQ which is a translation and cueing software. It is sort of Karaoke but VoiceQ can display a synchronized scrolling text onscreen, giving the voice actors and sound engineers an accurate cue to time-frames. Voice-over companies may use VocAlign PRO software that helps in automatically aligning the new dialogues to the original soundbite. Other software and editing tools like WavePad, Adobe Audition, Magix or Audacity can be used for automatic speech alignment or pitch correction and parameter automation. These tools have extensive features that can perfect the dubbing. After demonstrating the difference between dubbing and voice-over, now as a company you can decide which service you would like to go with it. Do you need dubbing or voice over services for video or audiovisual content to reach a wider set of an international audience? Apparently, Future Trans is up to provide both services. We are considered one of the most trusted dubbing companies and loved by clients for our vast experience in both services. We choose and handpick the most suitable, talented linguists for every project according to your requirements. Future Trans can offer dubbing and voice over services in over 150 languages. Our team consists of native speakers and linguist experts with experience in voice-over and dubbing projects for large companies around the world. previousDo You Know How To Expand The Reach Of Student Exchange Programs? nextWhy Dubbing Movies in Multiple Languages is Profitable? !